I call Robert Adams the 'mysterious sage' because we knew so little about him. He rarely talked about his past and hardly ever revealed his own feelings or thoughts about any personal matter, even when asked. It was as if he did not exist as a person. After being with him constantly for nearly eight years, all the stories he told me about his life might total three dozen pages. He almost always talked in the present. He always shunned publicity and avoided any publications about himself in all but a few Indian Journals such as the Mountain Path published by Ramana Ashram, and Inner Directions . He told me that the greatest teachers were unknown, and that he only wanted ten close disciples onto which to pass his understanding. Of course, the things he did tell me about his life or about what or whom he saw, are extraordinary, and I refer to these throughout this site. More than that, I do not think he wanted to be bothered with the duties and publicity that fall on public gurus. Years earlier (allegedly ― Some Baba monks doubt this), he had turned down the dauntless Muktananda, who wanted Robert to help him build Ashrams all over the world. He told Baba, "What’s the point?" A little later, he parted company with Yogi Bhajan after their seminars began attracting too much attention in Houston. He was also mysterious because he was so silent; he never stood out in a crowd and rarely ever expressed or demonstrated emotions. I never saw him angry, and I only heard him criticize people twice (Once me!). Once he cried when I cried after one of my cats died. He cried softly and very silently a few times at Satsang in Sedona when a few of us visited him there. We thought he was missing Los Angeles and us. He cried openly when watching a video of Ananda Mayi Ma, who he had known well. Mostly, he was free of emotion, and had been criticized by his family for expressing no emotion at his mother’s funeral, which he attended some years after he first returned to America. Without expressed emotional cues, it was always hard to ‘read’ Robert and sometimes his quietness and withdrawal felt somewhat cold to me. But there was no coldness there; there was a lack of presence. He was not there. Someone who was not there cannot be expected to be there in a human-emotional sort of way. He did not even pretend to be there in a socially acceptable way. Usually he remained quiet, sitting in the background, taking everything in. At lunch or dinner, everyone else would talk about all kinds of things, and Robert was mostly ignored, quietly eating while everyone else entertained each other in animated conversation. Robert only became the Guru at Satsang, when after sitting quietly for a long period, and after looking around the room, ‘feeling’ the vibrations, he would start speaking. After the talk, he would grow silent, and then ask for questions. Silence is the best description for Robert. Silence was his home, his source, his being, his teaching. Very soon after meeting Robert, he told me that even his wife of forty years thought he was strange. She truly believed that Robert was from another planet, and some day a flying saucer was going to land and take him away to his home. Years later, I joked about it with her, and she said, "Yes, I believe that!" Maybe, in a way, so did I. Robert was a remarkable and strange, strange man. He once joked that in order to be taken seriously when getting a loan at a bank, he put on a suit and "acted normally." He said they kicked him out anyway. Robert's "normal" would be considered bizarre for most. Imagine, not being a catatonic and sitting hours in a chair looking out into his backyard, not blinking an eyelash, for hours. Rarely did anyone ask him about his previous life at Satsang. Mostly even then he avoided questions about his life and experiences, especially during the early years when I knew him, before he gained wide fame as a teacher. Infrequently though, he would reveal some incident about his past, such as his meeting with Ramana, his awakening experience, or some jobs he had in the past. To the best of my recollection, what follows is a sketch of his spiritual biography gathered from what he told me, reading his own few publications and what he said at Satsang. Robert was born on January 21, 1928 in the Bronx. His mother was Jewish and his father Catholic. He once joked he took a lawyer with him when he went to Confession. He was a rebellious youth, always on the verge of getting into trouble. He questioned the practices of those around him, such as eating meat. His mother would sometimes kill chickens for the Sunday meal. Robert could not bear to watch or eat the meat. He was hounded by the question of how there can be a world where people ate animals, which was filled with suffering and death, and yet there supposedly was a God allowing all this. Of course, many people are tormented by that same doubt. He wrestled with this question until he was eleven, when one day, there came a sudden and overwhelming realization that there was no such world, it was an illusion! It did not exist. This is a very different kind of resolution indeed. Most people hounded by this question resolve it by dropping the question or turning to faith in some religious system. This eleven year-old's resolution was an adumbration of his future enlightenment. Robert’s earliest memory was of a small, two-foot high dwarf with white hair and a white beard that would stand at the foot of his crib and jabber at him in a language he could not understand. He said the man was quite animated, and constantly ‘lectured’ him. This little man finally disappeared when Robert was seven. 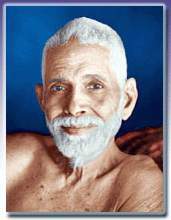 Years later, after his awakening experience, he was looking through a book on the teachings of Ramana Maharshi when he saw that sage’s picture. "I was shocked!" he said, "The hair on my head and neck stood straight up. The little man who had lectured me all those years was Ramana!" After the little man disappeared, Robert developed a Siddhi, a power. He felt the world belonged to him. Whenever he wanted something, he just repeated God’s name three times and within minutes or hours, it would be given to him. Once, after he thought he would enjoy taking violin lessons and doing the God’s name mantra, his uncle showed up with a violin saying he thought Robert might enjoy learning. By the time Robert was 14, he hardly studied any school subjects at all. Whenever a test came up, he would again just say, "God! God! God!" and the correct answers would come. One day, just before taking an algebra test in Mrs. O'Reilly's classroom, he repeated God’s name three times. Rather than the algebra answers, something else came to him, a total complete enlightenment experience wherein was revealed the transcendent knowledge of life and death, of reality and illusion. Robert withdrew even more completely from the world. He stopped eating, stopped going to school, stopped hanging around with friends. His mother was quite concerned of course, and, which was quite unusual at that time (1942) sent him to see a psychiatrist. Apparently the psychiatrist told his mother he would grow out of it. Robert had no idea what had happened to him, and began exploring Eastern religious books to find some meaning for the experience. He began attending meetings with Joel Goldsmith, taking a bus miles away in the City. One day, in a library, he spotted the book about Ramana Maharshi, which contained the photograph mentioned above. He also found the book, The Autobiography of a Yogi, by Paramhansa Yogananda, and made up his mind to stay with him. Curiously, those were two of the books I also discovered at a very early age. Therefore, at age 16, he left home to stay with Yogananda at the Self-Realization Fellowship campus in Encinitas, California. Robert always had a few Yogananda stories to tell, including one about his initiation into Yogananda’s order of swamis. After the initiation, Yogananda whispered into Robert’s ear, "Will you always love me, no matter what I do?" Robert, somewhat taken aback by the question, and thinking to himself, "What is this guy planning to do?" just responded, "Of course!" To make a long story short, Yogananda would not allow Robert to become a monk at SRF. As Robert confides, "He couldn’t wait to get rid of me. I kept asking why he taught all the practices, mantras, affirmations and healing techniques, when all of them missed the point of Self-realization." Yogananda’s expressed attitude was along the lines of, "I’ve done very well, thank you, doing things this way!" Because of the nature of Robert’s own spontaneous awakening, his connection to the little white haired dwarf, and Yogananda’s own devotional relationship with Ramana Maharshi, he told Robert to go to Ramana. During the Fall of 1946, Robert arrived by train to the town of Tiruvannamalai, a few miles from Arunachala Mountain, where lay Ramanashram and his future teacher, Ramana Maharshi. He took a bullock cart to the Ashram, was admitted, and stayed the night. Early the next day while walking back from the mountain, towards the Ashram, he spotted Ramana walking down the path towards him. An electrifying energy coursed through his body, and the last of what men call an ego left him. He felt completely surrendered, completely open. As Ramana got closer, Robert stripped off his clothes, approached Ramana and dropped to his guru’s feet. Ramana reached down grabbing Robert by his shoulder, and looked into Robert’s eyes with complete love and said, "I have been waiting for you. Get up! Get up!" Robert said that had Ramana asked him to leap over a cliff at that moment, he would have done so gladly. During the late 1940's, Ramana was almost constantly ill with severe arthritis and other ailments, including the cancer that eventually killed him. Few visitors were allowed to stay for more than a few weeks at the Ashram, so Robert lived mostly in the caves above, which also allowed him to avoid the crowds. Robert wandered across India and around the world off and on during the next 35 years, having married in 1954, and raised, often in absentia, two daughters. He sad when he married Nicole, she looked like Rita Hayworth. After he developed Parkinson’s during the 1980's, he settled down in Los Angeles with his family, where he began teaching, first to small groups at student’s homes, then to larger and larger crowds. He always felt he owed something to his youngest daughter for spending so little time with her as she was growing up. He also told me that the Parkinson’s was a gift, because it grounded him, ending his world travels. When he first knew he had the disease, he moved back to Los Angeles where his wife and daughter lived. He worked as handyman in a large apartment complex. His wife made clothes, which she sold, at swap meets and to various retail outlets. Eventually, because of the disease, he was no longer capable of the physical work involved and started teaching in earnest and gathering students. I do not think he ever wanted to teach again, but, as he told me, he had no other choice. He told me he had been living in a cabin in Oregon when he first noticed his hands trembling and some feeling of heaviness when moving. Eventually, he had a neurological evaluation, where, as he stated, "The doctor told me there was good news and bad news. The good news was that it was Parkinson’s Disease and the bad news it was Parkinson’s," meaning he did not have a brain tumor. Over the years, Roberts’ symptoms worsened. When I first knew him, the disease had already made speaking difficult for him and he was difficult to understand. By the time he left LA, it was extremely difficult to understand him because of his soft voice and his lack of control over his mouth and breathing. Often he would motion to me during Satsang and whisper into my ear what he was trying to say. Near the end of his days in Los Angeles, it was anybody’s guess as to what he was saying. I think he felt I could guess better what he was saying than the others at Satsang because I had known him so long, and had transcribed so many of his talks. One time he joked in Satsang that, "There are many teachers who give long lectures; there are many who are silent, but there is only one who mumbles." One of his students, that only met him once in Sedona, said that near the end, Robert was all but inaudible. This person said that all that Robert said, over and over, was "Freedom! Freedom! Freedom!," which had a profound and lasting effect on this person. His whereabouts during his periods of wandering and with whom he stayed are unclear. His daughter is currently writing a biography, which might better illuminate those hidden years. My recollection of what he told me was that when he was in India, he met most of the well known, and many not well-known, saints and sages that are India’s most valued export. He stayed about six months with Nisargadatta, about whom he said was very rude. When I asked him what he thought of Nisargadatta's teachings, he said something to the effect that Maharaj had added his own personal, and unnecessary interpretation of Advaita. He stayed with, or met, many other sages such as Krishnamurti and many more I never heard of. He lived in Hawaii for a time, where he led workshops on weight reduction and stopping smoking. He told me he taught attendees self-hypnosis and took them running on the beach every morning, which made them feel more alive and strong. He led a spiritual group in Santa Fe known as the Jnana Marga Society for a few years before coming to Los Angeles, but abandoned it, he said, in the middle of one night because all of the trustees were preoccupied with the money brought in at Satsang, and voting themselves large salaries. He gave me many of the newsletters he had written at that time under the Nom de Plum of M. T. Mind, to be included in anything I wrote about him later, which I have yet to do. Robert said he always had his seven league boots on to make sure he had not missed anything. Only advancing Parkinson’s Disease could bring his traveling to a halt. However, the sheer mystery of his past, led some of his skeptical sarcastic students, such as me, thinking he might have those seven league boots because someone with ten league boots was after him.